In October 2010, yet another complaint about the promotion of these products was submitted to the Therapeutic Goods Advertising Complaint Resolution Panel (the Panel). In an accompanying article in “The Conversation” it was noted that these products had been the subject of numerous upheld complaints and the sponsor (Pharmacare Laboratories) had a long track record of non-compliance with Panel determinations. In a determination dated July 31, 2013 (made available today) the Panel noted that representations made at a number of Internet pharmacy sites were were essentially subsets of the representations made at the website operated by Pharmacare. Moreover, only Pharmacare, the sponsor of the advertised product, submitted evidence in relation to the complaint. The Panel noted that the “evidence” provided by the sponsor appeared to be evidence that particular product ingredients had traditionally been used in homeopathy for particular indications. The Panel pointed out that traditional homeopathic evidence is not evidence that a product is efficacious or may be efficacious in providing particular therapeutic benefits. It is only evidence that a product or its ingredients have traditionally been used in homeopathy for such purposes. If representations based solely on traditional homeopathic evidence are to comply with the Code, then the advertisement must clearly convey that those representations are based solely on traditional homeopathic evidence, and that the evidence is of traditional use and not of actual efficacy. The advertisement should not convey that the product is of demonstrated efficacy for a therapeutic purpose or may be effective for a therapeutic purpose, but rather that it has traditionally been used for that purpose. The Panel was satisfied that the page contained many representations of therapeutic efficacy that had not been verified, were not correct and balanced, were likely to arouse unwarranted and unrealistic expectations, and were misleading, in breach of these provisions. The Panel highlighted that claims made for individual product “ingredients” such as “Aconitum napellus 12C [is for] acute chills and fever, sore throat, dry cough”, “Allium cepa 6C [is for] colds, runny nose, headache, cough, and hoarseness”, “Bryonia 6C [is for] sinusitis, headache, aching muscles, dry cough, sore throat, fever chills with external coldness” and “Pulsatilla 6C [is for] fever with chilliness, nasal congestion with constant chilliness and loss of smell and taste, dry cough, worse in the evening” were not raised by the complainants. As such the Panel made no finding in relation to these representations. The absence of any comment by the Panel in relation to these representations should not, however, be taken to indicate that the Panel found them not to have breached the Code or that their use in advertising is not misleading. A number of Internet pharmacies stated in response to the complaint that they had relied upon material provided by Pharmacare for website content. Pharmacare stated that they “have no control about third party advertising”. The Panel noted that where an advertiser publishes information regarding a product in an advertisement, it is a prima facie presumption that the advertiser is the person responsible for publishing that information even where it has been copied from material published by the product sponsor. The Panel accepted that the material in the retailer website advertisements was clearly similar to the material in the sponsors website advertisement, and appeared likely to have originated with Pharmacare. The Panel therefore made different findings in relation to sanctions for the retailer advertisers as compared with Pharmacare. The Panel noted that there was a large amount of misleading material in each of the advertisements, and that the material was directed to a vulnerable category of consumers, for ultimate use of the products by children and infants. The Panel also noted that small children and infants are often unable to ascertain or express clearly whether they are experiencing any therapeutic benefits from the use of a product. Moreover, the Panel noted that the misleading and unverified representations in the advertisement could in some instances result in consumers not seeking medication of demonstrated efficacy, because they would be misled into believing that the advertised products would have the benefits described in the advertisements. The Panel was therefore satisfied that it was necessary and appropriate for corrective information to be placed before the public. The Panel decided to request that Pharmacare publish a retraction, and that each of the retailer advertisers publish corrective statements. The retraction requested for the sponsor follows. Given previous non-compliance by Pharmacare with the Panel’s determination it will be of interest to see if this latest one is complied with. Postscript Sept 3, 2013. As expected, Pharmacare Laboratories have not complied with the CRP determination. The case has now been passed to the TGA where, typically, it will disappear into their black hole that has swallowed numerous CRP requests for Regulation 9 orders which have yet to see the light of day. 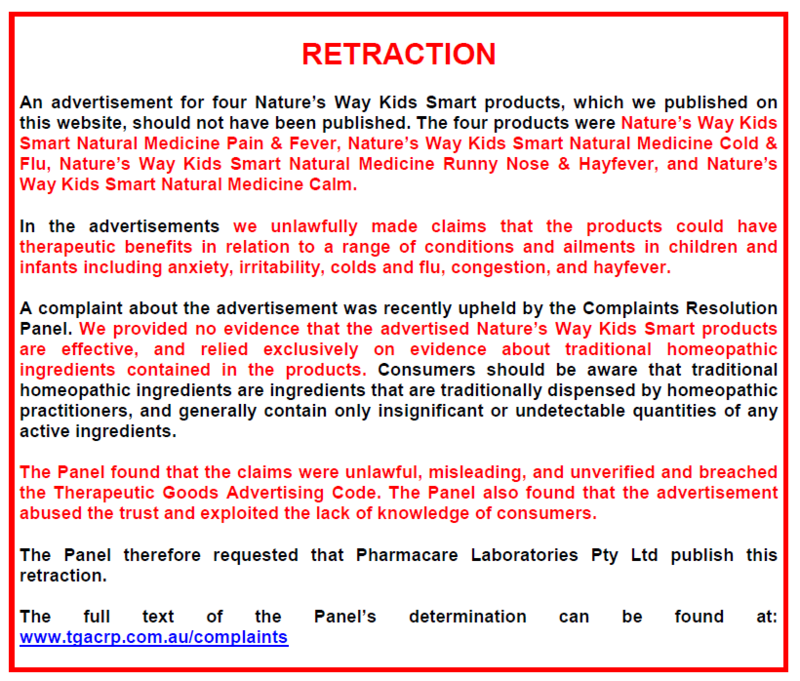 This entry was posted in Complementary medicine, Pharmaceutical Promotion and tagged Complaint Resolution Panel, homeopathic medicines, Kid Smart, Nature's Way, Pharmacare Laboratories, Retraction. Bookmark the permalink.